For Aaron Burr to claim he is “an inimitable…an original” can only begin to describe the wonder that is Hamilton on stage. Lin Manuel Miranda certainly did not throw away his shot when writing this musical as it is simply world-class and worth all the hype it’s built up since it opened on Broadway. While I disagree with the increased ticket prices for this show, I am still of the opinion that it is worth seeing and there are definitely seats from which the show is worth the money – no matter your price range. I started listening to the soundtrack back in 2015 during my first year of university and the song “Wait For It” especially was my favourite and helped me through a lot of tough times. It’s fair to sat that as the show started and the music of the first number began, my friends and I were so excited we began to shake. As much as I appreciate all understudies to shows, I was slightly disappointed to find out that I had understudies for the characters who hold my favourite songs in the show – Aaron Burr and Maquis De Lafayette/Thomas Jefferson. However, Sifiso Mazibuko who played Aaron Burr absolutely blew me away. “Wait For It” as my favourite song did actually make me cry (with no logic behind it as it is hardly the most emotional song in the show) but as the music reached its crescendo, the lights got brighter and Mazibuko’s performance got ever better, I couldn’t help shed some tears (and shake ever so slightly). I had the pleasure of telling him this at stage door and couldn’t thank him enough for such a beautiful performance. Other standouts to me were definitely Rachel John (Angelica Schuyler), Obioma Ugoala (George Washington), Cleve September (John Laurens/Philip Schuyler) and Michael Jibson (King George). Rachel John’s performance of “Satisfied” was absolutely phenomenal. While listening to the soundtrack I never felt particularly moved by this song; to me it was always a fun, sassy and important, but not a moving, song. John’s portrayal, however, finally had me seeing this song in a different way. Rather than Angelica just explaining what happened, her eyes and general facial expressions told the story from a different angle and you could truly see the love Angelica has for Hamilton. Her whole performance opened Angelica up as a more in-depth character to me and her sass, enjoyment for the role and talent was noticeable even from the upper circle. I would love to see her perform from closer up! I was lucky enough to see her in The Bodyguard in 2017 and when she was announced as Angelica I was definitely excited. I can certainly say I wasn’t let down. Obioma’s performance as George Washington really rocked me throughout. As a central character yet not one who often gets much recognition, Ugoala stole the show. His passion and the strength in his voice really presented Washington as the strong defining character he is. His rendition of “One Last Time” moved me as his voice completely captured and dominated the entire of the Apollo Theatre. I thought what was especially good was the way Washington and Hamilton’s characters built such a strong relationship and you could see their character development grow within such a short-space of time that represented what would have truly been years worth. Bravo. Cleve September was wonderful in every sense of the word. Playing both John Laurens and Philip Hamilton, the love September demonstrated for Hamilton was infectious. The performance of both characters broke my heart in September’s rendition and he really brought the show together for me. The fact that September was able to play both these characters, especially playing Philip at age nine, was outstanding to me. I found that there were similarities that September brought between his two characters which was especially endearing to me. 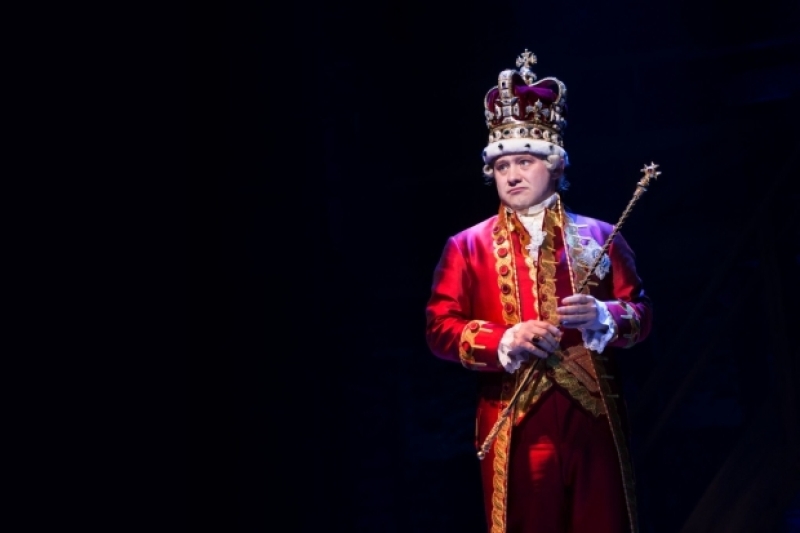 Michael Jibson as King George carried the show with his humour and total appearance on stage for all of about 6 minutes. What a genius with amazing comedic timing he is. The ensemble and rest of the main actors, of course, are definitely not forgotten. I know that a show is nothing without every member of the cast and creative and I can but only applaud each and every one of them. What I did especially enjoy was watching the performance of Leah Hill, who plays “The Bullet”. Her character always appears wherever there is trouble or danger – particularly death – and this concept I found a really nice and clever inclusion of the ensemble to give the show a bigger impact. The staging, lighting, costumes, choreography and design of the show as also faultless. The choreography, especially, was my favourite. Unlike other musicals which all usually have big dance numbers, Hamilton does not have this. Instead, what the cast does is move so dynamically throughout the rest of the numbers that wouldn’t traditionally involve dance, that the whole show is in effect one large dance. I thought this was incredibly powerful, mimicking the dynamic and power of the revolution. The whole show was faultless. The seats I was in was in the front row of the upper circle and my view was amazing. The price was between £50-60 and I would definitely say worth the money. While I would love to see the show from the stalls, I can’t say I agree with the price of the seats in the stalls, some at near £200?! This is one aspect of theatre I dislike and disagree with, especially in Hamilton. This show is revolutionary in its design, message and casting; promoting diversity and inclusion of everyone, yet only the rich and upper classes can afford the best seats to see the show. However, like I’ve said, there are seats in the theatre that are good value for money and I can do nothing but recommend this show to everyone. Previous Theatre This or That! Those ticket prices are far cheaper than the States. Perhaps I should come to London if I ever want to see Hamilton again. The tour was just in DC with many tickets $600-800 USD. Still, an awesome show. Haha yeah definitely come to London if you want it cheaper – still isn’t that cheap if you’re a student or on a minimal salary though!